Surrender has to take place in so many areas of our walk with God. First, we have to surrender our hearts to Jesus. Then, we give Him our past, our mistakes, and our sin. Once forgiven and restored to the Father, then we have to daily surrender ourselves. We can believe that God is real, that His word says wealth and riches are in our house, and still not receive. Unless we surrender out paychecks and bank accounts to Him. How do we know we have? When paying tithe doesn’t cause us to cringe, when giving an offering is an honor, when God tells us to give up something we worked hard for and give it to another… we can do it cheerfully. Jesus told us about the rich young man who came and asked what he should do to inherit the kingdom. Jesus said to follow God’s commandments and when this young man said that he had, Jesus asked him to surrender his wealth. He told him to go and sell all that he had. That young man left with much sorrow. He wasn’t sad because he was going home to sell everything. He was sad because he really wanted to please God, he just couldn’t surrender his stuff. He chose to surrender to his flesh. We have to be fully surrendered to the Father. A partial surrender is no surrender at all. For me, one of the hardest things to surrender to God has been my worry, and my plans. (Or my worrying about my plans). We sing in Church, “I surrender all my plans and dreams”. Recently when we sang it, I thought to myself, “Have I done that?” At that particular time the answer was, “NO.” It was a few weeks before the Fall Extravaganza Expo. This is an example in my life of an area where I needed to surrender. I have been in charge of the Expo for six years now and every year I am anxious that everything goes well, that I don’t disappoint anyone, that vendors and shoppers are thrilled, that the Church makes some much needed money, and that the whole thing is a success. Then, I worry if my stuff is good enough, if I will have to bring it all home again, if I will make enough money to make it worthwhile, and the list goes on. I had to purpose, in my mind; to go back to the day that God showed me the craft show in our gym. I had to remember the gifts and talents that He gave me. I had to stand on all the prayers and the confirmation of the Church leaders. I had to surrender the day to Him, and refuse to worry or lose sleep over it. Satan likes to use our past against us. There have been times that I jumped on the bandwagon and moved way ahead of God. So the enemy likes to remind me of those times. He tries to get me to doubt that I really heard from God, using those past mistakes as an example of my lack of communication with the Father. Or he outright lies and says that I am not allowed to have dreams or plans of my own, that my plans aren’t good, Godly, or important. But when we surrender our plans and dreams to God, it doesn’t mean we give them up, or that we shouldn’t have dreams or plans. In fact we are encouraged to dream big! So we do plan, we just make sure we are on the same page as our Father. One synonym for surrender is submit. Submission means “under the mission” so when we surrender our plans to Him, we are simply submitting our plans under, or unto His will, His timing, and His direction. So practically speaking when we have a dream or a plan we give it to Him. We surrender it. Then we ask for direction and wait for the leading of the Holy Spirit. Not something super spiritual, just allowing the normal communication between your spirit and God’s to take place. We may start out up and running full speed ahead, at His leading. Or it may be slow going at first with much prayer and meditation. Either way, don’t get so caught up in those plans that you aren’t putting God first, or shutting out that still small voice. Sometimes He is going to ask you to wait, sometimes to slow down, and other times He may ask you to change your plans. The ideal situation is to be so hooked up with Him, to practice being led by His Spirit, that your plans just line up with His. However, in reality sometimes we just want something to happen, or have some great idea that is only from our flesh. By submitting them all to Him we are giving Him permission to mess up our plans, or to confirm and expedite them. One way we submit them to Him is to share with our elders. Ask them to pray with you. This is a great place for comfirmation. When we know in our hearts that God has gone before us, that the plan is His, or approved by Him, we can surrender in confidence. It is His ability that brings it to pass. It might not be an immediate success, however, if we preserver, it will happen. The Expo is a great example of this, every year it gets better and better. There will be times that He will ask us to change our path, or the way we are doing something. Just like Sue said a couple weeks ago, there will be times that He asks us to “change lanes”. We are still accomplishing what we set out to do, but we are going about it in a totally different way. What Sue called taking the exit ramp and going around in a circle, God has shown me as “going around the mountain.” We know the song, “She’ll be coming round the mountain when she comes” for a while that seemed to be my theme song. I would try to reason out how to make something happen, or why it didn’t happen the way I wanted it, or where I went wrong. God says that is wasted time! When I thought moving forward would be a waste of time if I didn’t figure out all my mistakes, God was trying to save me time by getting me to move forward. At another Church we attended we had some families leave the Church. A friend came to talk about it with me and said, “The ship is sinking and we need to figure out who is punching all the holes in hull.” Of course, he wanted to blame someone. I don’t take credit for what I said to him that night, God gave me a picture in my head and I simply answered, “if a ship is sinking, the first thing you do is shore up the leaky places, you fix the ship first, and stop it from sinking.” I expected an argument, but he immediately agreed. That was God. Praying about it later God showed me that we don’t have to figure everything out. Asking “why” can be such a waste of time. He had it covered. People left because He was doing some housecleaning. Had we tried to play the blame game, some very nice people would have gotten hurt, and the Church may not have been able to pull out of the rough time. When things don’t go as planned instead of asking God “Why?” A better question to ask Him would be, “Now what?” He has a plan. Our circumstances aren’t a surprise to Him. He has us covered. Keep looking to Him to lead you. We can put the cart in front of the horse and end up with a lot of back peddling, or we can give our plans to Him, keep dreaming and open our hearts to direction. He knows what we need. Sometimes what we need is different than what we want. He is faithful and loving. As a good Father, He wants us to have only the best. Another big area of surrender that seems to elude Christians is surrendering our past. People go on pilgrimage, a journey to a place of spiritual significance, Christians and Jews go to the Holy Lands, Muslims go to Mecca. Some Christians take a pilgrimage back into their past, remembering every little ugly sin on the way, theirs and others. They make a big deal out of it; it’s a type of “penance” for them. This is a very important place of surrender, letting go of those mistakes. Like I said before, Satan is more than happy to remind us of them, but God says He has forgotten our sin, that He has cast them as far away as the east is from the west. He didn’t say North to South. If you travel from the North Pole, you eventually reach the South Pole and vice-versa. However, if you start from anywhere on the map and travel east, you never reach the west. It can’t be done. No matter how far you travel, there is always somewhere farther east, you just keep going in circles. That’s how we are to look at our sin. It’s gone! It’s under the blood. Stop revisiting those places! In my own life, in hindsight, almost every place where I really struggled with my faith, those distressing seasons in my life, were during times when I hadn’t fully surrendered. Our enemy will attack, but if we are totally surrendered to our Loving Father, He will lead us out! We don’t have to camp there. On the other hand, if we have areas of our lives that we haven’t given over to Him, we can find the duration of the attack much longer than needed. We all have to stand for something. We have heard that saying. So it also should be just as obvious that we have to surrender to someone as well. People surrender to an enemy because they fear for their lives. Then they live a life with rebellion and fear in their hearts. We have only a few options. Surrender to Satan, who is an abusive father and our end is Hell, to the world and our flesh who are careless parents who want to spoil us with stuff and feed our lusts, (which will ultimately end us in Hell, both of these kinds of surrender keep us weak), or we can surrender to a Father who IS LOVE. A strong Father who defends, protects, and provides for us. Surrendering to Him transforms our lives now, and gives us a wonderful future in eternity with Him. In this surrender we find strength, just as William Booth said. When we have trouble surrendering, it simply means we don’t trust Him. When God told me that I cried! Just thinking about how that made Him feel. I love Him, and felt that I was really getting more intimate with Him, yet there I was carrying a load that I wasn’t meant to carry, one that subconsciously, I didn’t trust Him to carry. Sometimes we just get lazy and forgetful. We go through a dry time, or even an easy time, and start carelessly picking up stuff we once laid at the cross, or listening to a voice that isn’t God’s. Before we know it we are “going around the mountain” instead of moving forward. Remember one of Satan’s main tactics is to distract us from God’s plan and path. If he can keep us focused on ourselves and going around in circles, then we can’t see clearly where we are supposed to be going. That’s why it’s so important to daily surrender. We can trust Him, in fact anything less than absolute trust is a lack of surrender, and God says it is sin. We should find it easy to surrender to someone who knows us inside and out, who loves us so lavishly, and knows what’s best for us. Did you mess up today? Surrender it to the Lord. Did you have a great accomplishment? 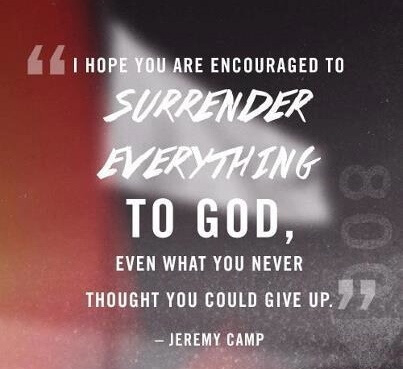 Surrender the glory to Him. Do you have loved ones that need saving? Stop nagging them and surrender them into the Lord’s hands. Are you wore down and tired of fighting? Turn the battle to the “Gate”! The battle is the Lord’s. Most of all stop trying to make things happen, stop trying to figure it all out, and just talk it over with Him. He is faithful, His Spirit will lead you and His word will light your path. Isaiah 30:20b-21 (NASB), “He, your Teacher will no longer hide Himself, but your eyes will behold your Teacher. Your ears will hear a word behind you, “This is the way, walk in it,” whenever you turn to the right or to the left. The world looks to all kinds of places, people, and possessions for their salvation. We all at one time realized that our lives weren’t the best. We tried to run and hide, we tried to find an escape, if only for a short time, we tried to cover up our mistakes, change our address, get a new job, or get a new spouse, only to have to face the hard truth, our lives were a mess. Some tried drugs, alcohol, relationships, immersed themselves in work, or in serving others, and still couldn’t find fulfillment. Others went to doctors, psychologists, counselors, palm readers, and fortune tellers, consulted our horoscopes, the stock exchange, googled, twittered, and tried to re-invent ourselves. But when we looked in the mirror, or looked at the condition of our soul, we were sorely disappointed, the change wasn’t there, was only skin deep, or wasn’t enough, or worse yet, we had changed so much that we weren’t even us anymore. So where do we place our hope? Who can save us? We can’t fix us. We can’t even clean us. We end up being white washed graves, looking good on the outside, but full of death on the inside. A doctor, a psychic, a teacher, or a religious leader, can’t change us. A ten step process, a secret formula, or some new “spiritual” phenomenon, won’t change us, not fully, or completely. Bull dog tenacity, strong willed perseverance, nor stiff necked stubbornness, can’t get us what we need, what we so long for. We need a Savior. Who can save us? There is only One who can. In fact, He already did. Not two thousand years ago, but before the beginning of time! We just have to accept it. Apply what was purchased on the cross, by the very blood of the Son of God, to our lives. Then He doesn’t give us the “wash and wax” or just to a make-over, He makes us brand new, something never seen before, not put together out of old junk, no Frankensteins here, just a complete new edition. It’s a miracle, plain and simple. All the work, the time wasted, the pain and brokenness, all for nothing. We hurt ourselves and others trying to do it on our own, and it’s time to stop. Maybe you are still living in the living hell of this fallen world. Just give up, surrender your heart to Him. He knows what you’ve been through, and He knows what you need. He sees your brokenness, your hurts, your faults, and frailties. Only He knows how. Nobody knows you like He does. You can trust Him with your life and with your heart. He is trustworthy. He is faithful.